High up on the 10th floor of the Assembly Hotel the Garden Room , brought to you by Bourne & Hollingsworth, has vast floor to ceiling glass windows so that all 100 seats in the house offer spectacular views across central London. Iconic landmarks such as the London Eye, The Shard and Nelson's Column, can be easily spotted. 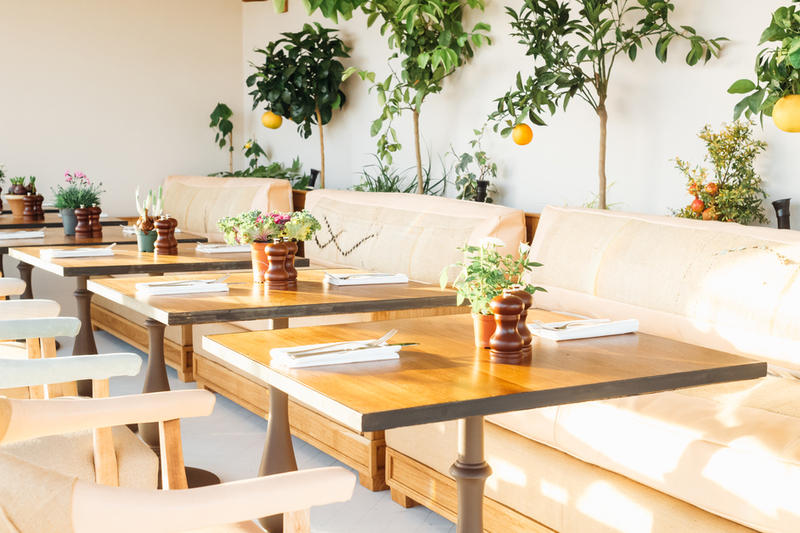 A natural evolution from the much Instagrammed interiors of B&H Buildings in Clerkenwell, the Garden Room bar and restaurant has a similar look. Pared back, classic interiors come with whitewashed floors juxtaposed with Aztec-style prints, tapestries, wrapped suede and wrought iron edges. A menu of cod on braised puy lentils and slow cooked spiced lamb is served to diners sitting on wicker and rattan furniture, reupholstered with patterned fabrics. At the bar cocktail maestro, Jim Wrigley, has worked closely with executive chef, Anthony Horn, to create a range of mixed drinks that incorporate the same fresh herbs and spices used in the food. The whole room is filled with fully-grown trees, trailing creepers and leafy plants, bringing the outside in while window boxes surround the room with herbs and seasonal plants. B&H Garden Room gyms, sporting activities, health & beauty and fitness. The best pubs near London B&H Garden Room. B&H Garden Room clubs, bars, cabaret nights, casinos and interesting nightlife. Where to have your meeting, conference, exhibition, private dining or training course near B&H Garden Room. From cheap budget accommodation to luxury 5 star suites see our discounts for B&H Garden Room hotels, including Radisson Blu Edwardian Hampshire Hotel from 89% off.